I'm repeating myself a bit today, but I hope readers will indulge me, as I've just become the proud owner of a copy of one of my favorite records ever. I have posted the A-side of this 45 before, 18 months before I began this "song poem of the week" project, but the MP3 shared at that time was cribbed from an eBay auction, and I never actually owned the record before this week. This means I can now share a higher quality MP3, can offer up the B-side, and can share scans of the record itself. 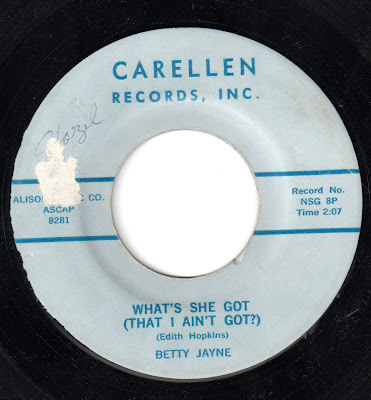 The record is "What's She Got (That I Ain't Got)", and I wrote about it at length in July of 2007, in a posting you can find here. 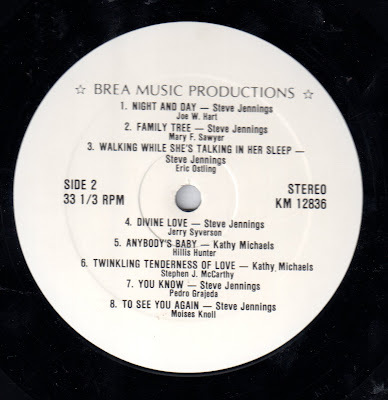 Without repeating much of that post, I will say that my love and admiration for this record continues to grow, and in particular I adore the lead vocal, and the masterful bridge, one of the best I've ever heard, made all that much better by a guitarist who had clearly been listening to "Love is Strange", but whose work here is superior even to that great guitar performance. There is some question in my mind as to if this is actually a song-poem. 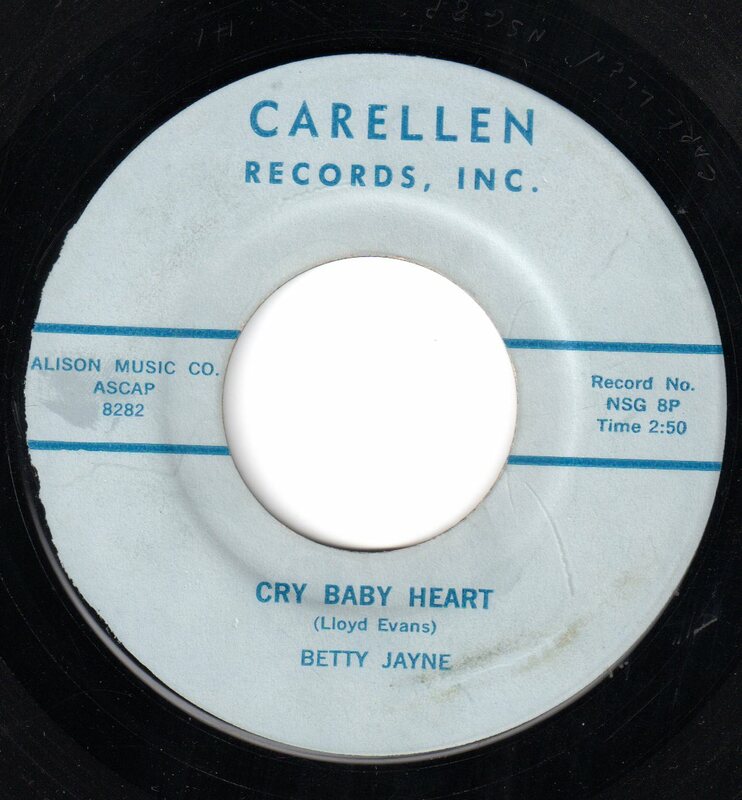 Carellen Records was a hybrid of sorts, releasing song-poems, vanity records and maybe even some records which were legitimate bids for hit status. And Edith Hopkins, the author of this song, and my all-time favorite song-poet, also commissioned both song-poems and more legit releases. I'll say this: If this is a song-poem, it's the best one I've ever heard, by a significant margin. 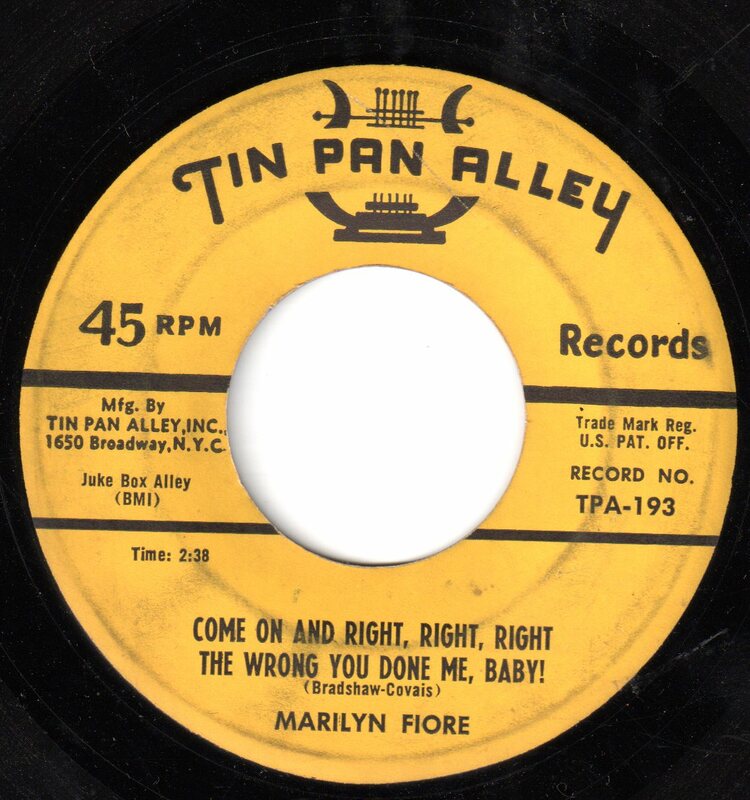 If it's a legitimate late '50's release, it's among my favorite records of that era (and that's saying something, as that is my favorite era for pop music). This is, in my opinion, a perfect record. The flip side, "Cry Baby Heart", is more of a standard late '50's rock-a-ballad, brought to above-average quality by another singularly great vocal by Betty Jayne, who clearly deserved to be a big star (I say this based on this and other records by her in my collection). My view of the likelihood of this being a song-poem record goes way up, when I hear that another take was not attempted, after the bass singer sang a a truly horrible note, right at the end of this performance. One thing I haven't featured much on this site are song-poems from the last three decades. I just don't find the vast majority of what I've heard from perhaps about 1976 or so on to be as compelling, as interesting or as wonderfully weird as what came before. The two biggest reasons for this are probably: 1.) The music styles which song-poem companies had to work with (to appeal to the most likely taste of their customers), after the mid-70's are not nearly as interesting or appealing as those that came before, and 2.) I think a larger percentage of the customers of these products were probably in on the scam by 1980, leading to a small pool of contributers, and a less interesting group, at that. An album I just bought, however, "Our World in Song", on the Brea label, contains a few exceptions that just about scream out for attention. And where to begin in discussing the deep weirdness that lurks within the song "Walking While She's Talking In Her Sleep"? It starts so normally, if you look past the nonsensical line about oysters and pearls. Before long, we come to the multiple repeats of the words "mumbling" and "over", as well as a truly incompetent guitar solo. The mile-a-minute words near the end are an added bonus. 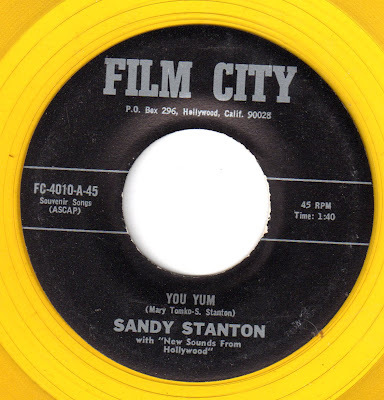 Finally, we have the simply titled "You Know". 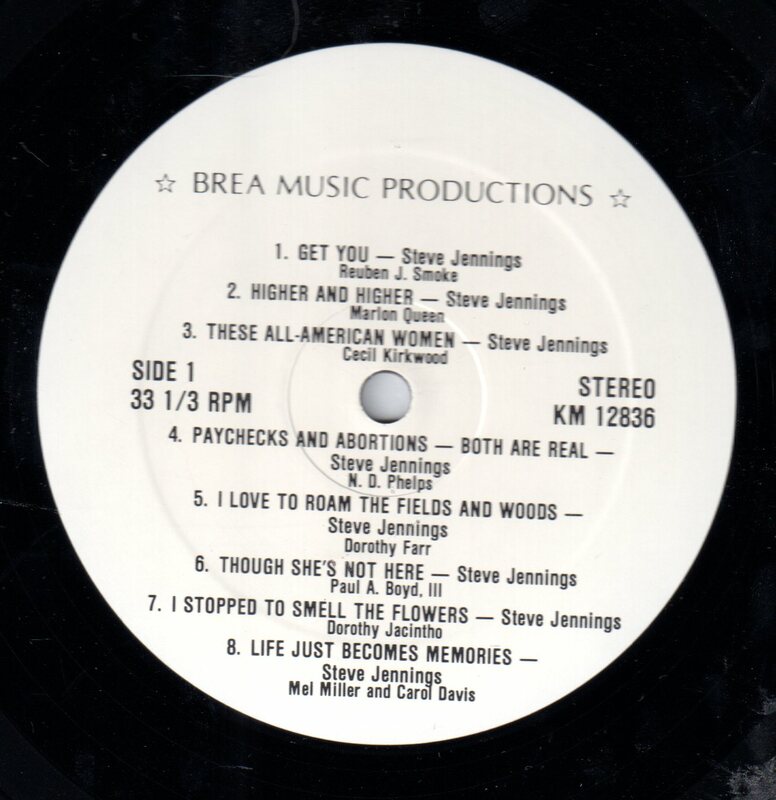 The painfully awful (and poorly conceived) accent adopted for this song does not hide the fact that the singer is the same Steve Jennings who sang most of the other songs on the album. One wonders what Pedro Graejeda thought of his song being done in a faux ethnic arrangement and vocal. But beyond that, have a close listen to the lyrics! The author describes sums up love as being the act of his lost lover returning to him, and compares her leaving to treason. He bars her from loving anyone else, and insists that she return, because that's what he wants, and after all, "love is like God". Today, another one of those "stop the presses" moments. I got this record this past week, and wanted to share it right away. Often, when a song-poem song title seems particularly ludicrous, the song itself can be a let down. But not this time, as Tin Pan Alley, circa 1958, offers up Marilyn Fiore with "Come On and Right, Right, Right the Wrong You Done Me, Baby!". 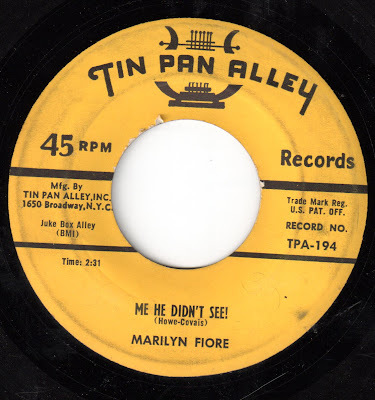 Ms. Fiore - who is otherwise unrepresented in the AS/PMA database - provides just the right sort of vocal for this lyric, and the band has the sound and feel of late 1950's down, too. Incidentally, the opening moment of this song, in which the original tape appears to be speeding up to the right pitch, is on the record itself, and is not from my turntable or any other source. Enjoy! The B-side, "Me He Didn't See! ", aside from another great title, could be accused of being essentially the same record heard on the A-side, but that's not always a bad thing, is it? 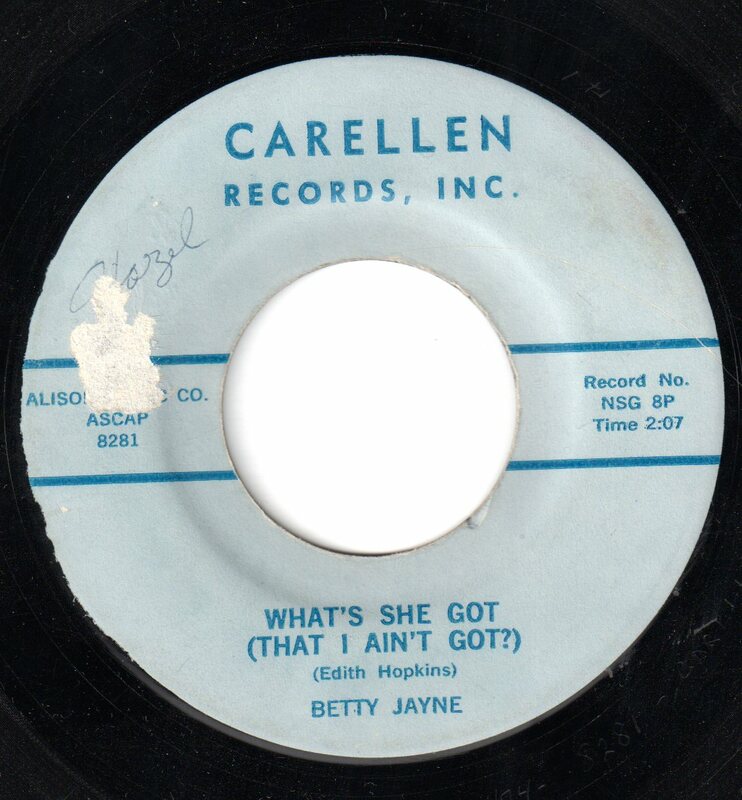 Besides, the lyrics here are just as fun as those on the flip, plus, there's a wonderful - if fairly unsuccessful - attempt at a rockabilly guitar solo on this one. This is what I call a great song-poem 45.